Availability Zones is a high-availability offering that protects your applications and data from datacenter failures. 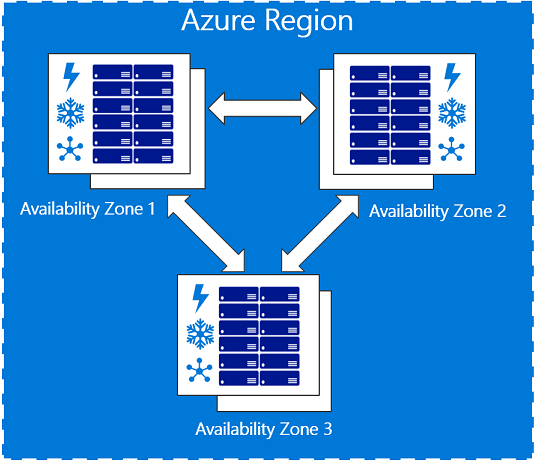 Availability Zones are unique physical locations within an Azure region. Each zone is made up of one or more datacenters equipped with independent power, cooling, and networking. To ensure resiliency, there’s a minimum of three separate zones in all enabled regions. The physical separation of Availability Zones within a region protects applications and data from datacenter failures. Zone-redundant services replicate your applications and data across Availability Zones to protect from single-points-of-failure. With Availability Zones, Azure offers industry best 99.99% VM uptime SLA. The full Azure SLA explains the guaranteed availability of Azure as a whole. An Availability Zone in an Azure region is a combination of a fault domain and an update domain. For example, if you create three or more VMs across three zones in an Azure region, your VMs are effectively distributed across three fault domains and three update domains. The Azure platform recognizes this distribution across update domains to make sure that VMs in different zones are not updated at the same time. Zone-redundant services – platform replicates automatically across zones (for example, zone-redundant storage, SQL Database). To achieve comprehensive business continuity on Azure, build your application architecture using the combination of Availability Zones with Azure region pairs. You can synchronously replicate your applications and data using Availability Zones within an Azure region for high-availability and asynchronously replicate across Azure regions for disaster recovery protection. * Resources created in UK South before March 25, 2019 will soon be converted to be zone-redundant. Resources created after March 25, 2019 will be zone-redundant immediately. All Azure management services are architected to be resilient from region-level failures. In the spectrum of failures, one or more Availability Zone failures within a region have a smaller failure radius compared to an entire region failure. Azure can recover from a zone-level failure of management services within the region or from another Azure region. Azure performs critical maintenance one zone at a time within a region, to prevent any failures impacting customer resources deployed across Availability Zones within a region. There is no additional cost for virtual machines deployed in an Availability Zone. 99.99% VM uptime SLA is offered when two or more VMs are deployed across two or more Availability Zones within an Azure region. There will be additional inter-Availability Zone VM-to-VM data transfer charges. For more information, review the Bandwidth pricing page.